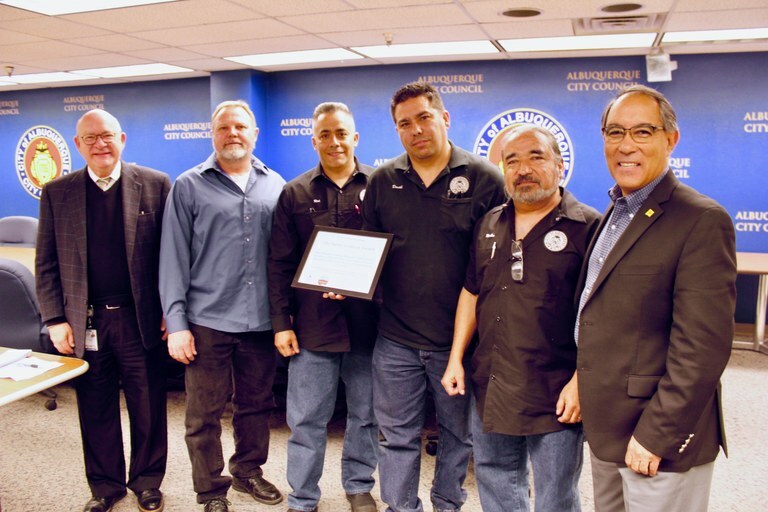 Four ABQ RIDE Mechanics from Transit’s Daytona Facility were honored by the City of Albuquerque today with its Safety Culture Leader Award. It’s part of a safety incentive program started last fall by the Risk Management Division to foster a citywide culture of safety. Albuquerque Chief Operations Officer Lawrence Rael presented the award signed by Mayor Keller at City Hall today to Transit mechanics Ron Hitchcock, Rodrigo Martinez, Ruben Minero and Daniel Romero for going above and beyond their duty to foster safety in their work. Among the accomplishments cited by the City, the four contributed toward making different tools to safely perform their jobs, such as creating a special hoist to place 125 pound alternators into place, instead of trying to manually lift them. They made sure that there were enough first aid kits to go around at work stations. They also made sure that waste material such as spent antifreeze, old filters and waste oil were always properly disposed. The award was started by the Risk Management Division last fall to encourage employees to create a work environment that’s safety-oriented. The four ABQ RIDE mechanics were treated to $100 Mastercard gift cards and lunch. Three other employees from the Family and Community Service Department were also honored with the award and received gift cards as well. From left: ABQ RIDE Director Bernie Toon, mechanics Ron Hitchcock, Rodrigo Martinez, Daniel Romero and Ruben Minero, and Albuquerque Chief Operating Officer Lawrence Rael.